The UFC on FOX 6 main event will feature the UFC flyweight title fight between the champion Demetrious Johnson and the challenger John Dodson. This will be the first opportunity for Johnson to defend the inaugural flyweight title since winning it in his last outing against Joseph Benavidez. This should be an action paced fight, so let’s see how it breaks down. John Dodson (14-5) is coming off the KO win over Jussier Formiga in his last outing to earn the shot at Johnson. Dodson has won six fights via KO/TKO and two fights via submission. 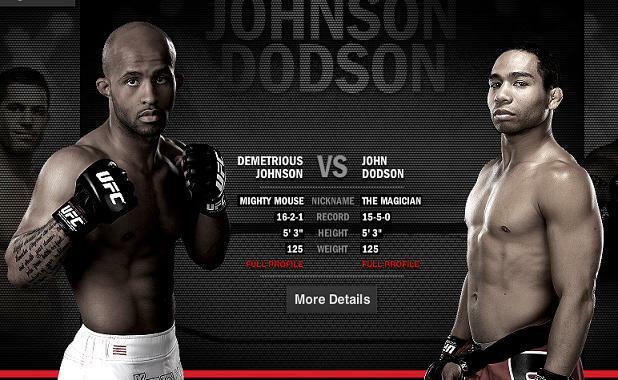 Dodson is arguably just as quick as Johnson with a bit more punching power and outstanding takedown defense. However, he has only been involved in one five round fight in his entire career which resulted in a split decision loss. It’l be interesting to see if he can maintain his power and explosiveness later in the fight. Demetrious Johnson (16-2-1) is coming off the split decision win over Benavidez in his last outing to win the title. Johnson won a four man tournament against some of the best flyweights in the world to get the honor. He hasn’t lost since dropping down to the flyweight division (2-0-1), and gave the much larger bantamweight champion Dominick Cruz all he could handle in a unanimous decision loss in 2011. Johnson has won three fights via TKO/KO and six fights via submission. He is arguably the quickest fighter in MMA with great wrestling and underrated striking, while having excellent cardio. Johnson is the betting favorite in this fight, but the odds are not outrageous as both guys are near equal skill. However, Johnson has probably fought stiffer competition throughout his career with better results. I think this fight will be pretty even during the first half of the bout, but I think Dodson may begin to fade about midway through the bout provided he doesn’t land a big bomb to put Johnson away. I think the odds of that happening are pretty slim, but Dodson has proven that he has excellent power for such a small guy. I think Johnson will use a lot of movement coupled with takedown attempts to attempt to wear Dodson down. He doesn’t have to be successful on the takedowns, but simply make Dodson work and that will allow him to do some damage from close range. If he can mix up his takedown attempts with solid striking from range I think he wins a unanimous decision. Dodson simply needs to fight from a distance and use his quickness to get in and out of range. Johnson is the more accurate striker, but Dodson should look to counter Johnson and land a big punch, kick, or knee especially if Johnson telegraphs a takedown attempt. If he can do these things it’s possible that he could stun Johnson and put him away, but he’d have to fight a near perfect fight to take the decision. Who knows? We saw Cain Velasquez fight a near perfect fight against Junior dos Santos at UFC 155, but I don’t expect that to happen on Saturday night.